MANGO Networks, Inc. - New solutions in Agriculture to grow food more sustainably and feed the growing population with healthy, tasty food sources. New solutions in Agriculture to grow food more sustainably and feed the growing population with healthy, tasty food sources. WE NEED NEW SOLUTIONS FOR GROWING OUR FOOD. 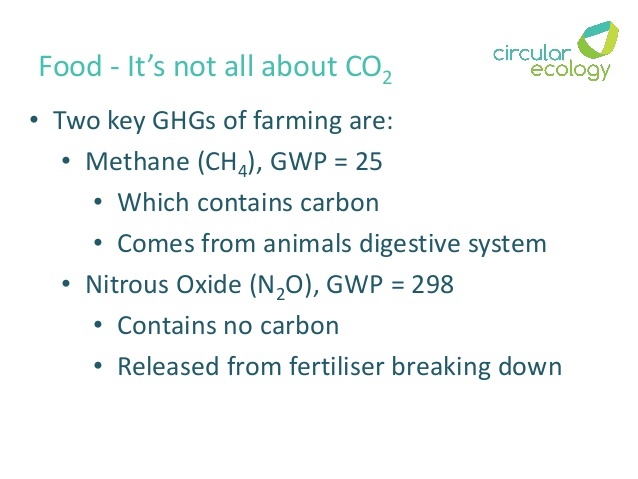 Yikes....Beef Cattle have a damaging environmental cost for us all. Agricultural run off from pesticides and fertilizers from outdoor farming is destroying out water. Photo below shows some incredibly tasty greens grown using Indoor Vertical Farming techniques from Bright Agrotech, recently acquired by Plenty, Inc. During Lisa's visit to Bright Agrotech she enjoyed a great tour by Elesif McDonald﻿. Indoor Vertical Farming with LED Grow lights and Hydroponics....Plenty allows people to GROW ANYTIME and ANYWHERE. Using 90% less water. ﻿Plenty, Inc grows leafy greens without pesticides or herbicides, and the food is non-GMO.﻿ Hot company in the San Francisco Bay area! Mango Networks sees a bright future for Indoor, Vertical Farming. We have been researching many innovative companies in the field and looking for companies with the best practices for commercial, Indoor Farming that make economic sense. Visiting indoor, vertical farms around the country demonstrates an incredible use of high tech for agriculural purposes. 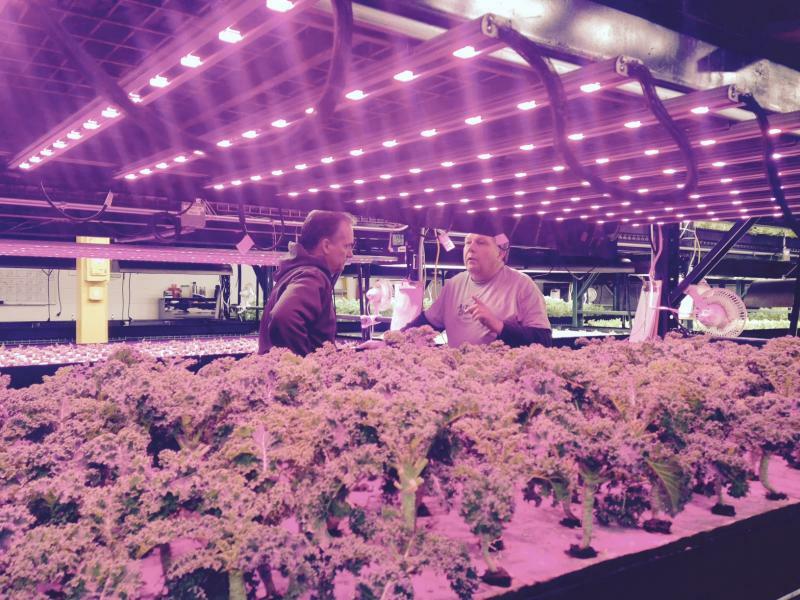 The delicious Kale is the super star of this photo shown growing at Green Spirit Farms in New Buffalo, MI. Seen in photo from left to right are Milan Kluko, founder of Green Spirit Farms, and Jeff Adams of Artesian Farms in Detroit. 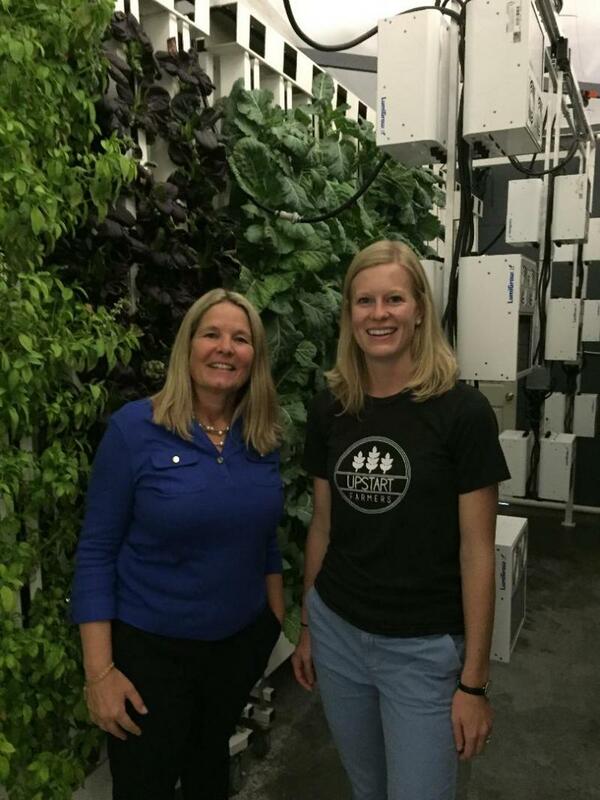 Congrats to the first Indoor, Vertical Farm in Detroit. Artesian Farms founder Jeff Adams has his heart and soul in the Brightmoor neighborhood of Detroit and we wish them great success. The market for LOCALLY grown, healthy, organic vegetables and fruit is growing rapidly. Here's an article from one of my columns written a few years back and I'm pleased to say demand is steadily rising and people are more consicous about the source of their food. An article by Lisa Lillelund on Buying Local. Local, Vertical Indoor Farms allow for Farm to Table within a 100 mile radius offers consumers more nutritious and more sustainable vegetables and fruits. Hydroponics, Aeroponics, and Aquaponics matched together the latest in Grow Light technology such as LEDs offer exciting new possibilities to grow tasty produce 24/7. Exciting companies and organizations to watch include Green Spirit Farms, Artesian Farms Detroit, CDC Farms and Fishery, Freight Farms, City Blooms, The Plant Chicago, and Illumitex. Photo of the tasty, Impossible Burger made from plants. 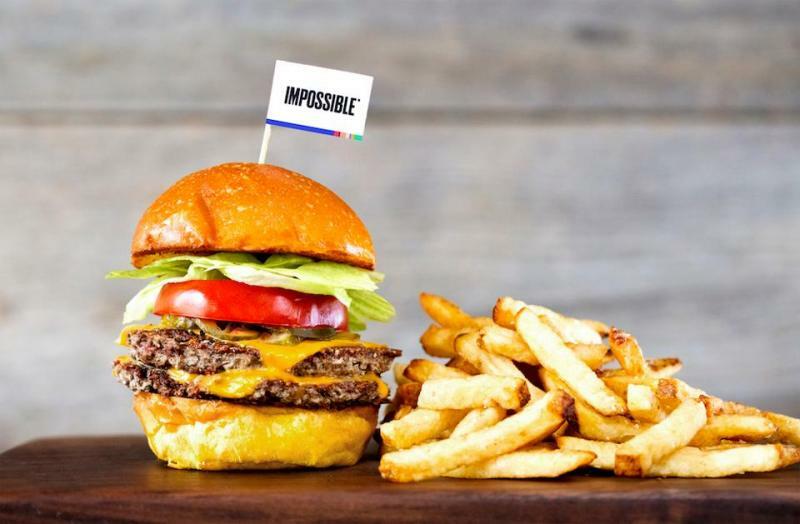 IMPOSSIBLE FOODS offers you a delicious burger...I tried it in Detroit and it was so tasty! 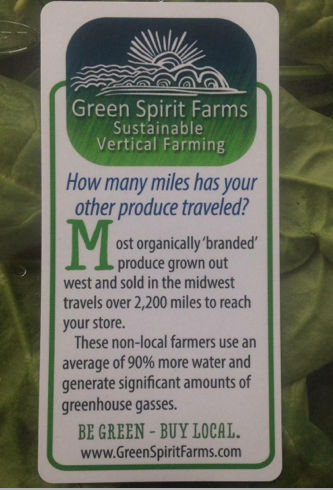 A head of lettuce or a tomato grown in California sold in Massachusetts travels over 3000 miles from farm to table. 3,000 miles of truck transporation emits around 3,000 pounds of carbon dioxide into the air and the energy to cool the trucks makes it even more polluting. Nutritional value declines over time during transportation. For every $100 you spend at an independently owned local business $68 stays in the community. For every $100 spent at a national chain store around $43 stays locally. Accrording to the Environmental Protection Agency, the Agricultural Run Off of Nutrients and Pesticides for Outdoor Farming can contaminate our lakes, rivers and streams and be harmful to humans and marine life. "Farmers apply nutrients such as phosphorus, nitrogen, and potassium in the form of chemical fertilizers, manure, and sludge. They may also grow legumes and leave crop residues to enhance production. When these sources exceed plant needs, or are applied just before it rains, nutrients can wash into aquatic ecosystems. 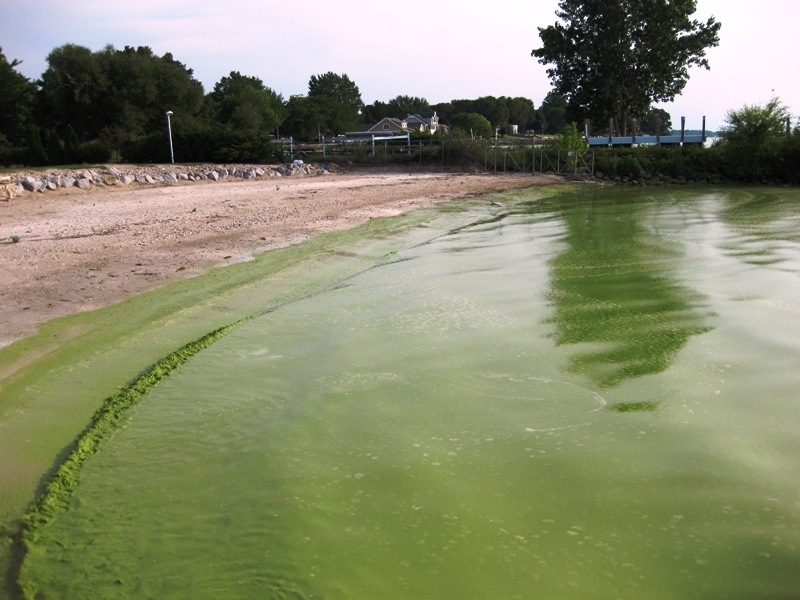 There they can cause algae blooms, which can ruin swimming and boating opportunities, create foul taste and odor in drinking water, and kill fish by removing oxygen from the water. High concentrations of nitrate in drinking water can cause methemoglobinemia, a potentially fatal disease in infants, also known as blue baby syndrome. "Insecticides, herbicides, and fungicides are used to kill agricultural pests. These chemicals can enter and contaminate water through direct application, runoff, and atmospheric deposition. They can poison fish and wildlife, contaminate food sources, and destroy the habitat that animals use for protective cover.﻿"
"Coastal HAB events have been estimated to result in economic impacts in the United States of at least $82 million each year. Ranging from microscopic, single-celled organisms to large seaweeds, algae are simple plants that form the base of food webs. Sometimes, however, their roles are much more sinister. A small percentage of algal species produce toxins that can kill fish, mammals, and birds, and may cause human illness. Other algae are nontoxic, but clog the gills of fish and invertebrates or smother corals and submerged aquatic vegetation. Others discolor water, form huge, smelly piles on beaches, or cause drinking water and fish to taste bad. HAB impacts are far reachingHarmful algal bloom (HAB) events can be very bad for us. People who eat shellfish from waters experiencing toxic blooms can become very ill and can even die. Does that mean that the seafood you eat may be unsafe? Not at all. Rigorous state shellfish monitoring programs ensure that legally harvested seafood is safe for human consumption. HABs also have economic and cultural implications, especially in coastal communities dependent on harvesting seafood and tourism. They frequently disrupt the commercial, recreational and subsistence seafood harvesting and cause some to cancel beach vacations." IMPOSSIBLE FOODS offers you a delicious non-meat burger...I tried it in Detroit and it was so tasty! !